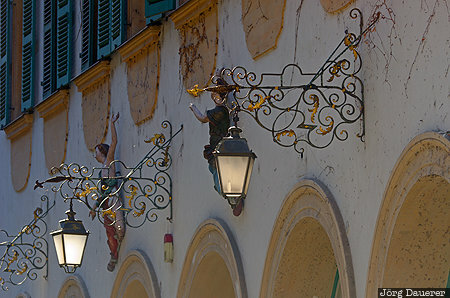 Two richly ornamented street lamps in downtown Bamberg back-lit by warm evening light. Bamberg is in Upper Franconia (Oberfranken) in the north of Bavaria, Germany. This photo was taken in the afternoon of a sunny day in September of 2012. This photo was taken with a digital camera.